We have seen earlier that the subtle energy is takes the form of a square and the gross energy takes the form of a circle with an in‐between state it takes the shape of a octagon. According to Pranava Veda, these three intermediary archetypical forms have separate qualities. Thus they are called the three Gunas. Guna means quality. They are Satvva (8×8 Square; Rajas (octagon); and, Tamas (circle). Sattva, according to Mayan is a steady restful, and peaceful state. Rajas is a dynamic state of form. Tamas contains massive or gross material qualities. 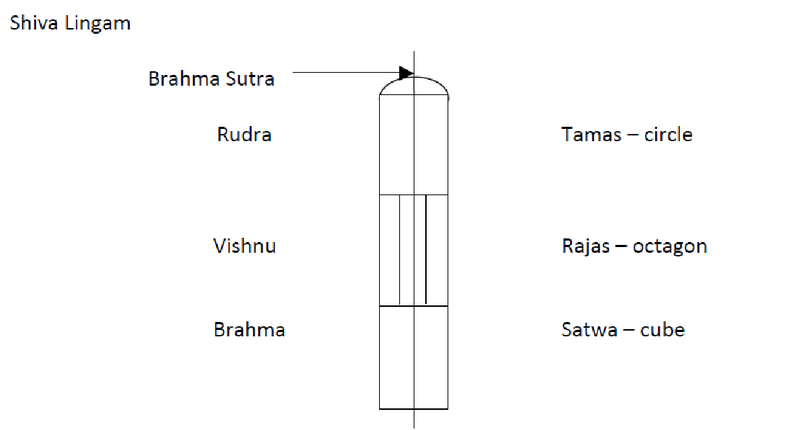 These forms are encoded within the structure of the Shiva Lingam. And, the real meaning of the Shiva Lingam is ascertained from what we have just mentioned. It is a visual form of the intermediary part of the manifestation process that is literally contained within each of us. Sattvic represents the perfect state of balance. When it is subtle it is luminescent and in a perfect state of resonant non‐vibration. The energy levels were perfect so that the resultant vibration is nil and it is in absolute balance. Tamasic state represents a state where the height of evolution is reached and hence it is farthest away from the core. The core is very subtle and the tamasic state is very gross and hence it is away from the core. Tamasic state then should be considered as the darkest state possible. Why? Because the core is luminescent and if the gross state is farthest from the core hence it should be dark. This is the meaning behind the most famous statement ‘Tamasoma Jyothir gamaya”… take me from darkness to light. It is not about just your mind but about the entire being aspiring to become a light and merge with primordial light. There is no evolution possible beyond the Tamasic state and it has to devolve to reach its core / subtle state. Rajasic is a state where the pulsation has resulted in a rotational force and hence things are set into action. This represents the evolution process and hence associated with action.Then the natural next question is, if Shiva Lingam is associated with the entire spectrum of consciousness then we should see it associated the five elements and the light. Isn’t it? There is a story in Indian Purana that Brahma, Vishnu and Shiva discussed who is the most powerful among them. Lord Shiva challenged Brahma and Vishnu to reach his head and feet respectively. Brahma tried to find Shiva’s head and Vishnu tried to reach Shiva’s feet, both of them failed. Most of us would have heard the story but would not have understood the philosophical and scientific significance. 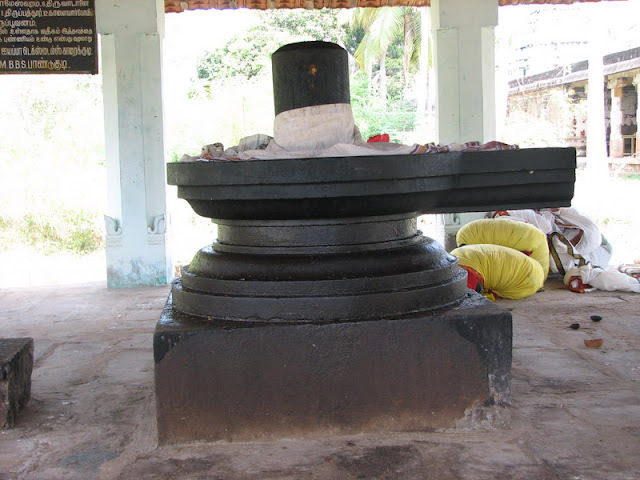 Shiva in the form of Lingam stood there as a PILLAR OF LIGHT. This pillar of light is the Brahma Sutra / light of consciousness which spanned from the center of the galaxy (Hiranyagarba) to every being & non‐being in the Universe. Brahma could not find the head because; Brahma is always associated with intelligence in Indian texts. He gave the supreme wisdom ‐ the Vedas and stands for Intelligence. He could not reach Shiva’s head signifies that Intelligence will not take you to God. Intelligence as an energy is too gross and cannot reach the most subtle state of light. Vishnu represents earthly life – Rajasic in character – this is the tetrahedron & octagon state. He could not reach Lord Shiva’s feet signifying you cannot reach the core through actions. Shiva in the form of Lingam is represented as one of the five elements (Earth, Water, Fire, Air, and Space) in the temples. Shiva Lingam represents the Pillar of Light and the entire spectrum of consciousness. From the most subtle to the most gross. It represents an semi-form Guna state (between un‐manifest and manifest) and hence it is formless with a form. By this analogy, our body itself is a lingam with the visible body as the gross part at one end and the most subtle body which is invisible and is part of the primordial light at the other. This entry was posted in Religion, Science, Spirituality and tagged articles, education, inspiration, lingam, philosophy, religion, research, science, spirituality, temple by Ganesh. Bookmark the permalink. love this! makes 100% sense. right down my ally! Nice explanation. Even if one takes it literally, shiv means auspiciousness and linga in sanskrit means sign or symbol, it is sign of consciousness or auspiciousness. Well invited post. Excellent. Nice presentation too. A wonderful piece of explanation for the everyday man. Who has lost touch with is roots due torelocation in the western world. Thank You for the wonderful explanation.